Episode 96 - Arjun returns home with some bad news and some good news. The bad news is that they have lost their powers and have lost their friends. The good news is that they finally get to retire. Yudhistira doesn't hesitate. He strips off his fine garments and leads his brothers into retirement. Krpa is put in charge of defense, Yuyutsu is made regent, and Parikshit is king. Parikshit's grandmother Subhadra (Krishna's sister) is made Dowager Empress. 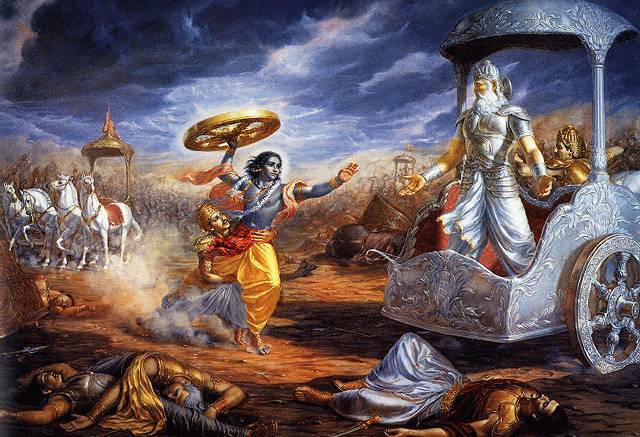 The Pandavas then take a final tour of India, visiting even the former site of the magical city of Dwarka. Finally, they head north, for Heaven, with their little dog Dharma. I listen to your podcast It is really great . Thank you for podcasting the great epic. I am an India , I have learnt stories since my child hood. I have complete 88 episode from you pod cast. I didn't come across you telling the story of consprircy of SHAKUNI,that shakuni was ploting againist kaurav's takeing a revage on his brother in law DHRUTHARASTRA because DHRUTHARASTRA KILLED ALL SHAKUNI'S BROTHERS and so on... do you know about this? I have heard stories along those lines, including a curse that Gandhari's first husband would be killed, so they married her to a donkey, then killed the donkey before she married Dhrtarastra. But none of this is in any version of the epic that I have seen. I have no idea where the story came from-- perhaps one of the other Puranas? Or maybe it is a later tradition. If I could find a source on these missing stories, I'd love to include an episode on that; we'd call it The Lost Tales!